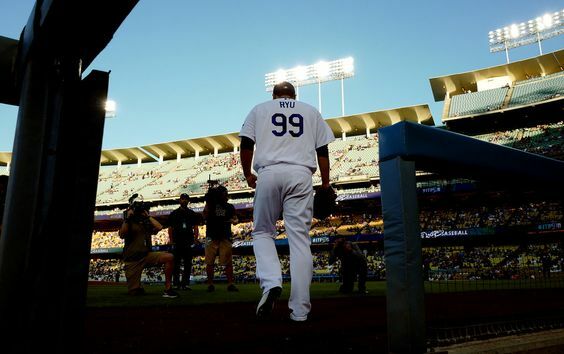 Game 88: The Dodgers have 99 problems, and Hyun-Jin Ryu was one Thursday. The Dodgers are still waiting for the Hyun-Jin Ryu of 2013 and 2014 after his 2016 debut, a 6-0 loss to the San Diego Padres on Thursday. Columnist Mark Whicker isn’t buying the Dodgers’ optimism over Ryu’s return. Corey Seager doesn’t think the Home Run Derby on Monday will ruin his swing. Pitching prospect Josh Sborz finds himself in a no-win situation of sorts. This entry was posted in JP on the Dodgers, Postgame thoughts and tagged Corey Seager, Hyun-Jin Ryu, Josh Sborz, Padres, San Diego by J.P. Hoornstra. Bookmark the permalink.